Home > Uncategorized > Durham Presentation and S240! 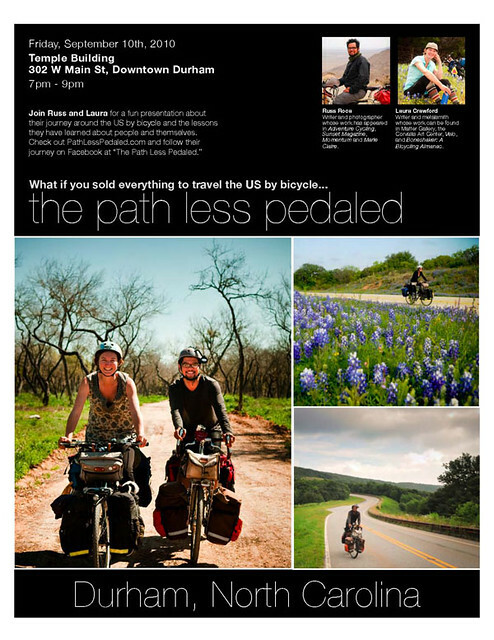 Just a reminder that we’re giving a presentation on bike touring in Durham tomorrow night (Friday)! If you’re in the Durham, Raleigh, Cary area and have always wanted to know what it was like to go on an extended bike tour, you should come by! We’ll have the bikes fully loaded and you can check out the various doodads we use. There will also be tons of photos and stories from the road. Here are the details and a link to the Facebook Event page. We hope the presentation will get you fired up enough to join us on an overnight bike camping trip the next day! We’ve only done this in one other city (Austin, TX) and it was a great success. If you’re tour-curious or have a Surly LHT and haven’t “broken it in” yet – we hope you join us! Even if you don’t have a touring bike but can stuff some camping stuff in a bag and strap it on your bike, we hope you join us! One the great revelations that most people come away with is that bike camping is tremendously easy and fun and they often wonder why they haven’t done it before. Itinerary: We will ride down the trail through Durham, Chatham and Wake Counties to Jordan Lake. Campsites are already reserved. To book a spot, please email Jack directly. I wish I could have joined you guys for this ride, but I’m in Portland for the week. I flew out for a conference, and rented a bike instead of a car. Best vacation decision I’ve made. Mostly I’ve been tooling around between Southwest (around Hawthorne and 39th), the Lloyd District, and Downtown, but today, I took the day to ride out to Gresham along Powell Blvd, and back along the Springwater Corridor, and up the waterfront, and back along Salmon. What wonderful cycling infrastructure you have out here!